"Don't make me run, I'm full of chocolate!" 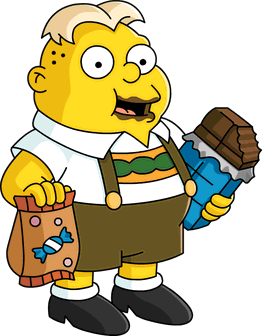 Üter Zörker is an overweight exchange student at Springfield Elementary School from Bavaria, Germany. 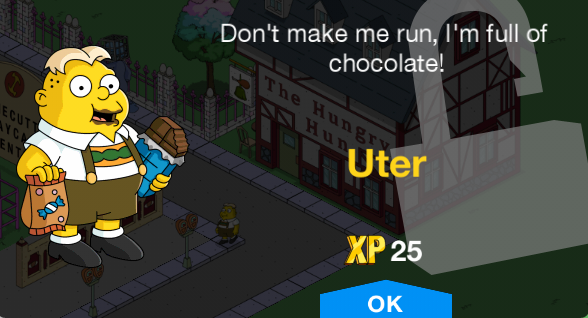 Little is known about Üter though he is notable for his obesity, which tends to result in misfortune for him. He is obsessed with candy, especially chocolate. Üter is also proven to be friendly as he offered to share candy with Bart one time. In the future as an adult, a healthy Üter also donated a digestive tract to an ill Bart as he was a loyal customer to the product Bart was selling, fish logs, and ate nothing but them since then despite that they eventually became no longer profitable. Despite his physique, Üter used to be a player of the Kwik-E-Mart Gougers Peewee Hockey League Team. He also enjoys flirting with Lisa Simpson and sometimes tries to befriend Bart. He enjoys watching German football. He also seemed to be an enthusiast towards science fiction, as he was seen attending the Bi-Monthly-Science-Fiction-Convention. Üter once got left behind on the American Civil War field trip and subsequently went missing. He was attacked by civil war re-enactors while Principal Skinner thanked his precious permission slips. His parents demanded Skinner to inform them of their missing son's whereabouts. However, he has since reappeared. He was once seen stuck in a cobweb in the school air vents, to no avail. Üter then reappeared some time afterwards. At one point, when Lisa was discovered to have a crush on Nelson Muntz, the other children began taunting her about it. When Milhouse denied the claim, the children began teasing that he had a crush on Lisa. Janey then denied that claim, causing the children to taunt her about having a crush on Milhouse. Üter then denied that Janey had a crush on Milhouse, which prompted the students to instead claim that Üter had a crush on Milhouse. Üter has two parents, and an uncle who is the a proud owner of a bubblegum-factory in Düsseldorf (respectively Basel in the German version). Üter is most likely based on Augustus Gloop, the gluttonous German boy from the book Charlie and the Chocolate Factory by Roald Dahl and its 1971 film adaptation Willy Wonka & the Chocolate Factory; which is rather ironic, since Üter once made a chocolate diorama of the book. His favourite catchphrase is "don't make me run; I'm full of chocolate!". Contrary to the common English assumption that Üter is a Swiss name, it is probably a misconstruction of the common German name Günther. In the German version of the show, Üter is named Uter and is an exchange student from Switzerland with a thick Swiss-German accent. 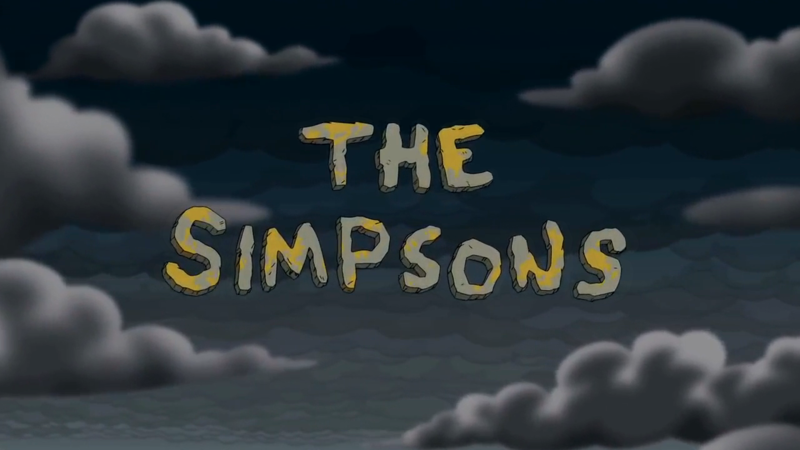 Wikisimpsons has a collection of images related to Üter Zörker.